A former Roswell, Ga., police sergeant who was fired for flying a Confederate flag outside her home is suing the Roswell Police Department … with the help of a group with alleged white supremacist ties, CNN reports. Silvia Cotriss, who had worked with the Police Department for almost 20 years, was fired in July for flying a Confederate flag above her front porch at her home in the neighboring town of Woodstock. Her attorney, David Ates, is now arguing that the termination was a violation of her constitutional right to free speech as a private citizen. "She was displaying her pride in her Southern heritage and honoring her recently deceased husband," the lawsuit claims. "The Confederate flag [is a] generally accepted symbol of Georgia heritage." 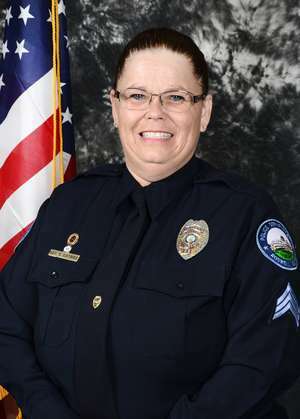 Cotriss is seeking either reinstatement of her former position or 10 years of pay and other compensatory damages in the lawsuit against the city of Roswell and the Roswell chief of police. As CNN notes, Cotriss is also being represented by the Southern Legal Resource Center, a North Carolina nonprofit that is "dedicated to expanding the inalienable, legal and civil rights of all Americans, but especially America's most persecuted minority: Confederate Southern Americans," according to the about section of its Facebook page. The group was co-founded by Kirk Lyons, who is described by the Southern Poverty Law Center as a "white supremacist lawyer." According to CNN, Lyons has denied any association with hate groups, saying that his job is to ensure that Cotriss "gets a fair shake after being unfairly terminated." Her termination came during intense scrutiny of the Confederate flag following the shooting that left nine parishioners dead at the Emanuel African Methodist Episcopal Church, a historic black church in Charleston, S.C. The gunman in that incident, Dylann Roof, who was recently convicted on all federal charges in the shooting, had posed for photos with the Confederate flag.